It’s time to look forward to the warm season, after a long, snowy winter and a cloudy spring. Will we see a repeat of the scorcher summer of last year? Or will it be more like the cool, rainy, “year without a summer” of 2009? Or maybe it will be something in between? In order to answer these questions about the future, it’s prudent to examine both the past and present to look for clues. 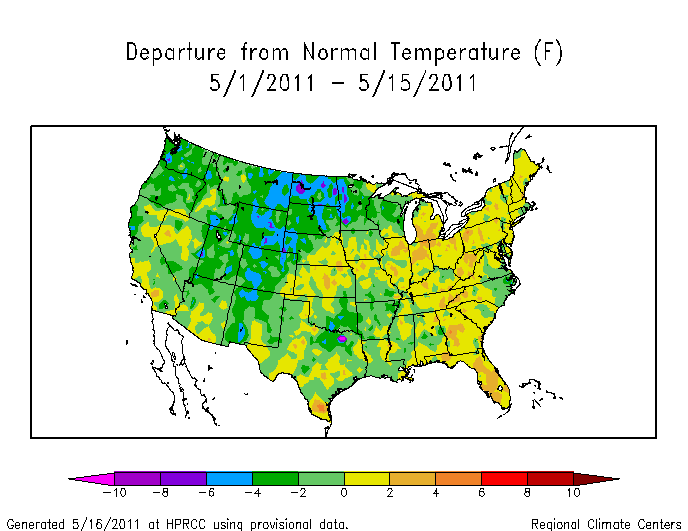 The spring pattern this year has been the polar opposite of 2010: colder temperature anomalies relative to normal across the northern US, and warmer anomalies in the Southern US. This temperature anomaly orientation has enhanced the north to south thermal gradient, consequently aiding the massive severe weather / flooding season we’ve witnessed. Large temperature gradients, with cool in the Mid-west, heat in the South, and high humidity in the Southeast, are the perfect ingredients for large scale convective outbreaks. 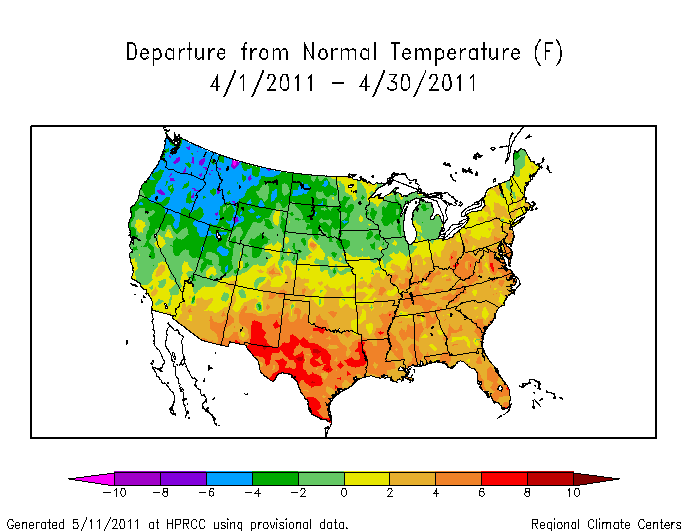 Contrast that with 2010’s spring pattern: the inverse temp pattern (warmer north, colder south relative to averages) inhibits T-storm and severe weather outbreaks. Zooming in on our local region, we’ll likely fall within a relatively short list of 12 years (since 1970) which featured both a warmer than normal April AND May temperature wise. It may be difficult to believe as April was a very cloudy, gloomy month, but temperature departures have been above normal for the better part of this spring. With the last two weeks of May likely to feature increasing warmth in the Eastern US, it’s likely that we’ll finish with a warmer than normal May. However, if we throw the Atlantic Multi-decadal Oscillation (AMO) into the mix, we see that 4/5 of those cool summers featured a negative (cool) AMO signal, and 6/7 of the warm summers featured a positive (warm) AMO signal. A negative AMO implies the sea surface temperatures (SST’s) in the Atlantic are cooler than normal, while a positive AMO means SST’s are warmer than average overall. 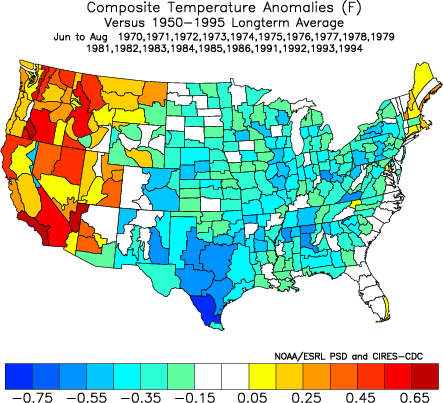 We’re currently within a positive (warm) AMO regime (AMO value for April was slightly warmer than normal) lending more credence to the warm analog years noted above: 1980, 1998, 1987, 1991, 1999, 2001, 2006. 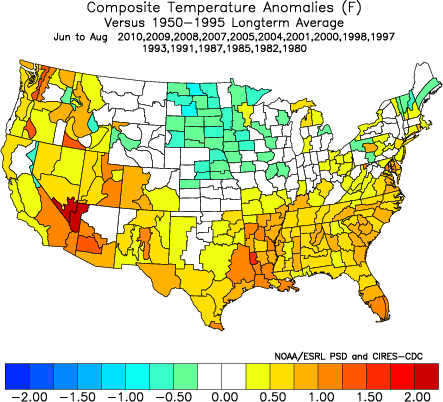 The correlation is clear b/t AMO modality and temperature departures during the summer season (particularly in the Eastern US). Another important factor to consider is ENSO. Over the past two years, we’ve seen ENSO vacillate from strong El Nino (2009-10), to strong La Nina (2010-11), and now weakening to near neutral values. It’s been awhile since we’ve held a near-neutral ENSO status, and this regime looks to continue for the summer and probably autumn. What will next winter feature? Considering the transition to negative PDO base state (colder Pacific), and the statistics regarding post strong La Nina event winters, there’s a high probability of remaining in the La Nina state. My guess right now would be weak La Nina, but that’s for another discussion. The latest value for ENSO region 3.4 is -0.38c, within the neutral territory, and as per most modeling, we should stay there throughout the summer. The Multivariate ENSO index (MEI) is another method of diagnosing ENSO state, and right now we have values around -1.5, which suggests the atmosphere is still in a moderate to strong La Nina state, even though the ENSO region SST’s are telling us we’re near neutral. Looking at years that were similar to 2011 in terms of ENSO progression, the best fits are: 1971, 1974, 1985, 1989, 1999, and 2008. However, when we include the AMO state, 1971, 1974, and 1985 are eliminated due to a cooler than normal Atlantic being present. When we include the Pacific Decadal Oscillation (PDO; like the AMO except for the Pacific), we should eliminate 1989, because a positive (warm) PDO was present. This leaves us with 1999 and 2008 being the top 2 overall analogs for the upcoming summer: -PDO, +AMO, and similar ENSO progression. 1999 also has the similar spring temp anomaly progression for April/May, while 2008 has the most compatible solar environment to the current year. The North Atlantic Oscillation (NAO), while more applicable for the winter season, still has some influence in the summer months. 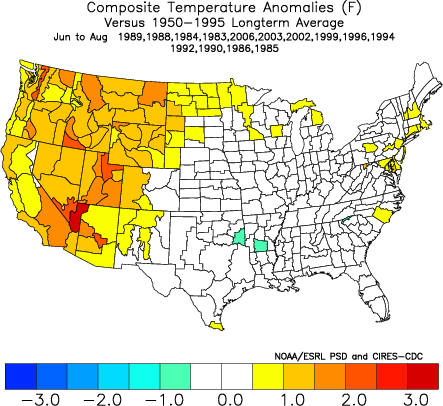 Below is a comparison between positive NAO and negative NAO summer temp departures (since 1980). I anticipate the summer of 2011 to have a neutral/negative NAO, based upon the current Atlantic tripole configuration (warm north, cool central, warm south), a continued low solar environment, post strong Nina statistics, and NAO trends over the past few years. 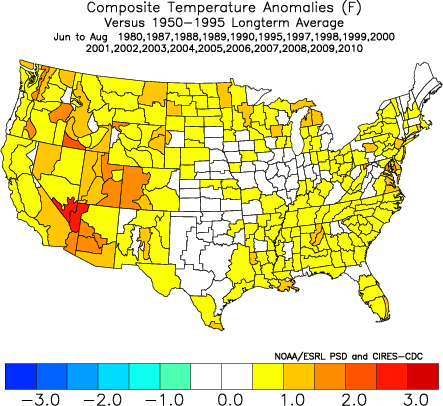 Since 2008 featured a summertime –NAO, I see that year as the best analog for the upcoming summer (due to all the various factors mentioned). 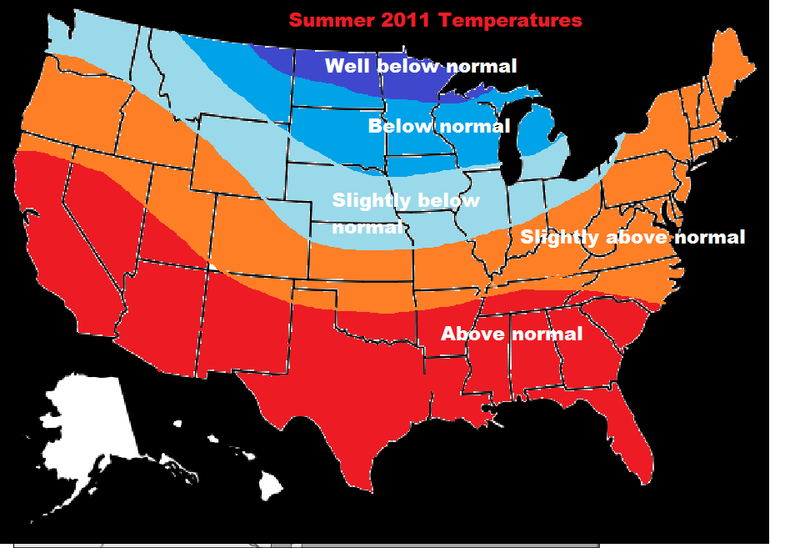 Summer 2011 should be warmer than normal in the Northeast, with the biggest heat occurring in the front part of the summer, and the coolest temperatures in August. Precipitation will be greater than normal for the majority of the Northeast for June-July-August. In addition, I anticipate this summer to be more humid than is considered “normal” due in large part to the already very warm/moist Gulf and Atlantic. An overall warm, humid, wet summer should be on the way. Below was the conclusion/numbers issued back in May for this summer. The idea that the front half of the summer would be much warmer than the second worked out well, along with the forecast of above to well above normal rainfall.